Home»Channels»Transit»BUSRide WebinarPLUS: Are Alternative Fuels Really Going to Save Me Money? BUSRide recently conducted a webinar for our readers with Todd Mouw, president of ROUSH CleanTech. He discussed propane autogas as a fuel alternative and its implementation process, and fielded questions about where it will help agencies and operators save on operational costs. Tell us a little about ROUSH’s background. We were formed by Jack Roush, our founder. He’s still our majority shareholder. We’re privately held and based in Michigan with about 4,200 employees, and the majority are engineers. Within Roush Enterprises, Roush Industries is the technical arm that gives our world order, so that’s where the OEM involvement is with companies like Ford, GM, Chrysler, and engineering prototyping and design. Jack Roush has built the business the last four decades. Our wheel of services includes everything from concept design and styling, body engineering, powertrain development, noise, vibration, harshness, technical communications, sales, distribution, and customer service. These are all in-house capabilities here at Roush. How did ROUSH CleanTech come about? ROUSH CleanTech is one of our divisions. We incubated within ROUSH Performance in 2006 and formally founded the company in 2010. During that 2006 – 2010 period we invested close to $50 million in building a robust foundation. That’s the technology itself, the manufacturing process, and the supply chain. Our mission is dedicated to developing quality alternative fuel solutions. Our goal is to help fleets make the transition away from gasoline and diesel to something cleaner, lower-cost, and domestic. Everything we do is certified in all 50 states, both EPA and CARB, so we can deploy this technology across the country. Through our growth in the past year and because of increasing costs of traditional fuels and complexity, we know that we’ve just scratched the surface regarding where this technology will go in the next decade. We have more than 18,000 vehicles on the road with well over half a billion miles. We have about 1,100 individual customers in the United States and Canada. Why is propane a good fuel alternative? Propane is clean, domestic, plentiful and safe. There is a low cost of infrastructure, which is much easier to integrate than say a natural gas station because of the high-pressure nature of that fuel. Propane is low-pressure with a narrow flammability range. The tanks are 20 times more puncture-resistant than traditional fuels. It’s 105 octane. From a performance perspective, it allows the vehicle to do the job it needs to do. The beauty of propane is that we can customize the platforms to put tanks in the right locations so there is little impact in how you do your business today, which is transporting people safely. We can give you comparable range to the chassis and the engines you’re used to running. Why do you think propane is fitting for paratransit? We’re fans of all the different technologies. It’s going to take a combination of all the different emerging fuel types and propulsion technologies to get us away from gasoline and diesel. We analyzed different fuel options in their ease of adoption, energy independence, reduce in NOX, infrastructure, cost of ownership, range, maintenance, how scalable is it, and how it operates in cold weather. Some emerging technologies like electric vehicles (EV) have a lot of benefits from an emissions perspective. With propane, when you’re talking specifically paratransit operations, we can provide 300 plus miles of range, low NOX emissions, relatively free or low-cost fuel infrastructure, and a lower total cost of ownership because the fuel is much cheaper than traditional fuels. We thought propane was a huge win in this space, in the Class 4 – 7 vehicle range. What makes Roush a unique company? The magic sauce goes back to our relationship with Ford for the past 40 years. Ford gives us access to their calibrations. We’re one of a few qualified calibration modifiers as well as a qualified vehicle modifier for gaseous fuels. What that means is Ford preps the vehicle for propane by hardening the valve seats, then turns it over to a company such as Roush, they approve, and then we develop the fuel system and still maintain the base OEM warranty. 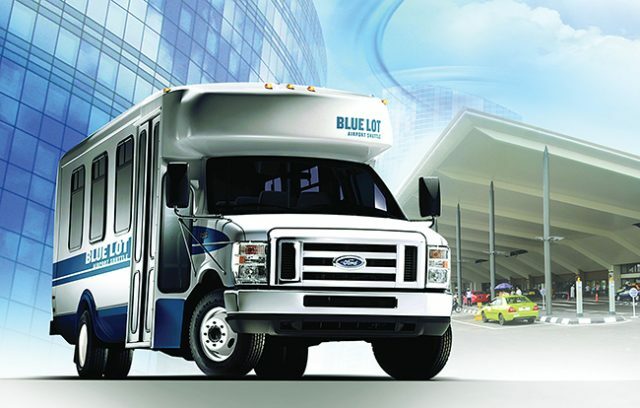 We offer medium-duty Ford trucks, chassis cabs, cutaways, and stripped chassis; and Blue Bird Type A and C school bus. Everything is Ford-factory maintained. That’s unique to Roush, the OEM Ford endorses what we do and maintains the base warranty. When we change it from gasoline to propane we then warrant the components we modify, but the base Ford factory warranty is intact. There is no change in horsepower, torque, or towing capacity of the vehicle, so you’re not compromising how the vehicle would operate. It’s very serviceable with existing diagnostic equipment. We’re also EPA- and CARB-certified. 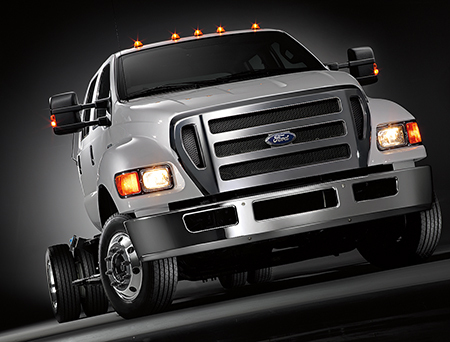 We have gone through Altoona testing on the E-450 and the F-550. What is the technology on the vehicle like? 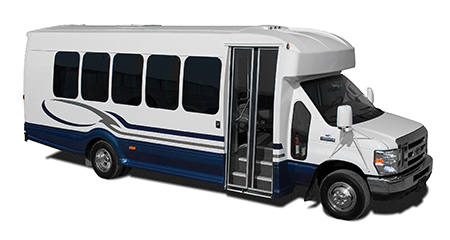 For the E-450, there is a cutaway chassis and a stripped chassis, although the primary focus for the paratransit audience is the cutaway. We support the 2018 model year and newer vehicles. We’ve had certification since 2011 on this chassis. It’s the 6.8-liter V10 2-valve. We support all the different wheelbase configurations from 158 to 176 as well as the stretched wheelbase applications. We offer two different fuel tank options. One’s a 41 usable gallon capacity, and there’s an extended range option of 64 usable gallons. The 41 usable gallon option comes with a five-year, 60,000-mile warranty. The extended range option comes with a five-year, 100,000-mile warranty. Later this summer we are launching the E-350 single rear-wheel and dual-wheel cutaway with the 41 usable gallon tank. We’re basically taking the gasoline components off that Ford builds and replacing them with purpose-built propane components. It’s a one-piece blue aluminum fuel rail, fuel rail pressure control module, special fuel injectors, stainless steel fuel lines, fuel fill, and the tank. There aren’t a lot of moving parts and pieces in this technology. Absolutely! We will bring in our team in to help train you. We have a very robust online training program when you’re starting out that gets technicians comfortable with what propane is and how our technology integrates into the vehicle. Then once the vehicles hit the ground, we send our technicians to train your technicians. That’s free of charge. The relationship with Ford makes a big difference. As far as the peer to peer part of it, having a lot of customers and a lot of data to share makes that transition easier for the companies that haven’t done propane yet. What are some successful propane integrations that you have enacted? We started with DART in Delaware in 2014 with a five-unit pilot. It’s now grown to 165 E-450 cutaways. 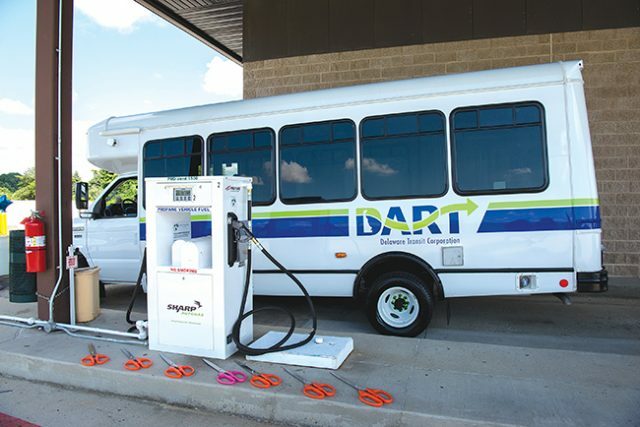 Those are pretty powerful numbers when you talk about DART’s $11,000 weekly fuel savings. Obviously, there is a reduction in carbon dioxide. They believe in the technology. As they’re replacing their cutaways, they will go to 100 percent propane by 2020. Again, it’s an exciting story that started with five. We had one location with a thousand-gallon tank. Now it’s grown to the full fleet with four locations that will have fueling infrastructure with significant savings both on the cost and emissions side. Another example is Flint, Michigan, which is the one that started everything for us in the transit market. Their former Maintenance Director Lynn McLean was the first one to say, “I think we should look at propane for our paratransit fleet.” He helped educate us on the process as well as introduce us to our sales lead in this market, Randy Veenhoven, our Executive Director of Transit. Flint started with a handful of vehicles and has migrated to 146 units. You can see again by the numbers they’re saving significantly in fuel costs. They save about $70,000 per vehicle, so it’s almost paying for a new bus in lifetime fuel cost savings. Prior to making a commitment to transitioning from vehicles to propane autogas, what kind of steps should an agency consider or take? I would let our team come in to understand how the fleet operates, the number of vehicles, the types of vehicles, and the duty cycle. Typically, we would bring in a propane company with us at that time just to look at the location, so they can understand how infrastructure can be put on the site. That’s usually an hour-long meeting where we’ll go through total cost ownership, answer some technical questions, talk about training and support, and do a fuel site analysis of your location. Again, that’s an easy way to start. Once propane vehicles are in deployment are there any kind of considerations they should make to make sure it’s a smooth transition and there’s not any loss of service? I think we’ve learned a lot over the last decade in regard to providing the level of service that allows you to keep your business the way you’ve been doing it. Again, I think making sure we understand ahead of time how you service your vehicles is very important. Some agencies do all the service in-house. Some use third parties. Some use Ford. Those will be questions early on in that first meeting. We’ll ask, “How do you get service done? How can we support you? Is there anything unique about your operation that we should be aware of?” Ultimately, we want to make sure all the homework’s done ahead of time and there are no surprises once these vehicles start operating. Can you explain the benefits of a dedicated system versus bio systems? 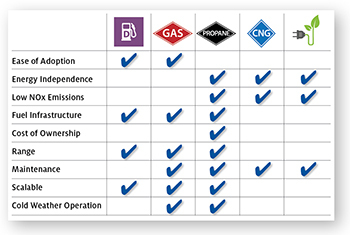 We believe if you give a driver the choice to switch back and forth between gasoline and propane, human nature will take over and they will stick with what they know. Our belief has been in developing a robust technology, which we have, and giving you enough range so you can run that lower cost and cleaner fuel 100 percent of the time. We can give you 300-plus mile range on an E-450. With plenty of range, plenty of capacity, and a robust technology, you should take that option away from your drivers to drive change within your organization. What are the best financing resources for agencies looking to make a transition to these types of vehicles? FTA funding is an option. We have a team that’s dedicated to helping find grants and incentives for our customers and our partners. In some cases, we have propane companies such as Amerigas that have a rebate per bus. They will give you a rebate back by signing a fuel contract with them. There are multiple ways for an agency to finance that incremental cost between gasoline and propane. Although, we would argue that the number of miles that are run leads to the investment being paid off relatively quickly, especially with FTA funding in place. Are there any concerns for running propane autogas vehicles in hot or extremely hot weather? We’re talking about liquid propane technology. Liquid propane absolutely loves the cold. We’ve seen it work all the way down to negative 60 up in Alaska. We want to keep it in its liquid state, so when it gets really hot, especially on an E-450 cutaway, the fuel wants to vaporize, which causes a rough run type of condition. Four or five years ago we developed a chiller system which chills the return fuel going back in the tank. We started with a school district in Mesa, Arizona, where obviously they’re operating at 110 degrees plus for a significant portion of their day. This chiller system alleviates that concern. Yes, if it is in high heat, you want to make sure when you’re looking at propane that you have some sort of technology like our chiller system in place to ensure that vehicle runs the way it should.